Now, a Ninth Circuit copyright case provides further proof that one can’t hold a copyright on elements found in nature. 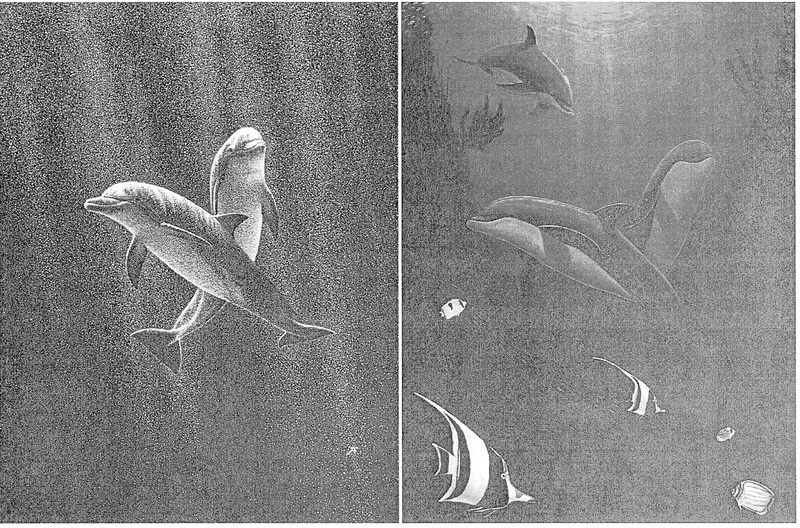 In September 2014, Peter A. Folkens, a “world-renowned wildlife artist, illustrator, photographer, researcher, and author,” filed suit alleging that famed marine life painter Robert Wyland infringed his copyright on a pen and ink illustration entitled “Two Dolphins.” According to court filings, “Two Dolphins” is a black and white depiction of two dolphins crossing each other, one swimming vertically and the other swimming horizontally. Wyland’s painting, “Life in the Living Sea,” depicted an underwater scene consisting of three dolphins, two of which are crossing, various fish, and aquatic plants. Folkens alleged that Wyland’s painting constituted an unauthorized copy of “Two Dolphins” because the scenes they depicted were substantially similar. In May 2016, a federal district judge dismissed the case on the grounds that Folkens couldn’t lay claim to “the idea of a dolphin swimming underwater,” since natural positioning and physiology aren’t protectable. The Ninth Circuit, however, found little substance in Folkens’ argument. As they explained, the fact that a pose involving animals can effectively be staged by trainers doesn’t mean that the same pose can’t occur in nature. The Court also pointed to its 2003 ruling in Satava v. Lowery, which made clear that “no artist may use copyright law to prevent others from depicting ideas first expressed by nature.” While an artist could achieve copyright protection by adding his own original expression to the work, the bar for reaching this level of protectability when dealing with subject matter drawn from nature was relatively high. As the case was only decided this month, it’s not immediately clear whether Folkens will appeal. If anything seems certain, it’s that this will likely not be the last time an artist seeks copyright protection for art inspired by nature. One can only hope that courts will continue to ensure that nature remains in the public domain.